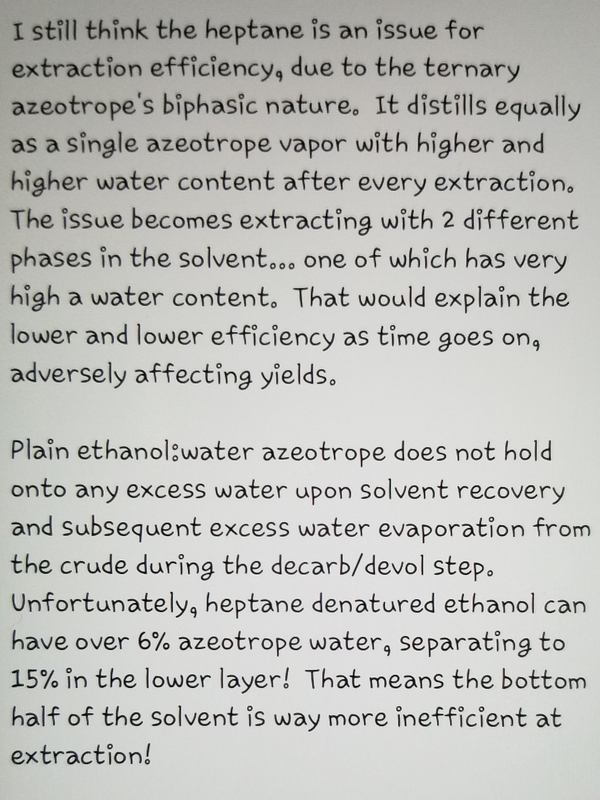 I am writing this to help those of you performing alcohol-based cannabis extractions, and especially for those playing around with n-heptane-denatured ethanol, isopropanol, and other less expensive alternatives to 190 proof potable ethanol. 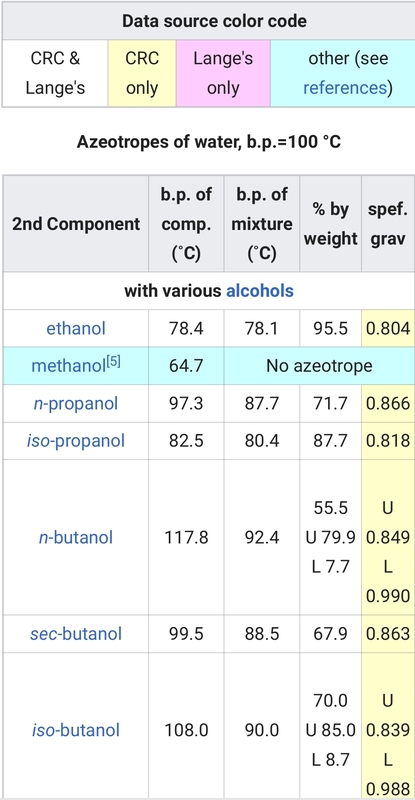 Please understand that drinkable 190 proof ethanol, isopropanol, and n-heptane denatured ethanol are very different animals. I strongly advise people to reclaim and reuse solvent as much as possible, rather than just buy cheaper solvent. 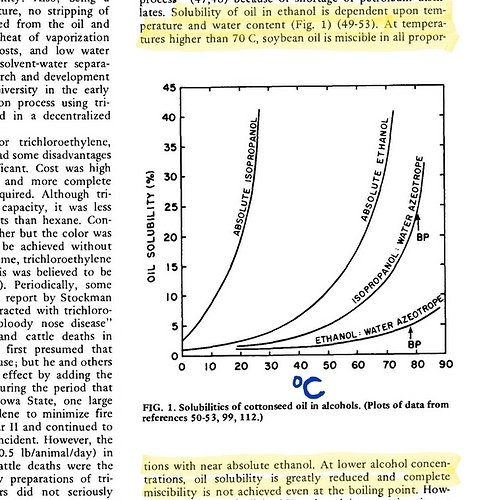 190 proof potable ethanol is “perfect”, as long as you treat it with effectively cold temperatures (below -40°C/F) and commensurately brief biomass contact (residence) times to achieve selective resin extraction. It can be your enemy at higher temperatures and higher residence times, but it will be your best friend at -67°C or lower, at which point residence time without extracting green pigments increases to practically infinity. 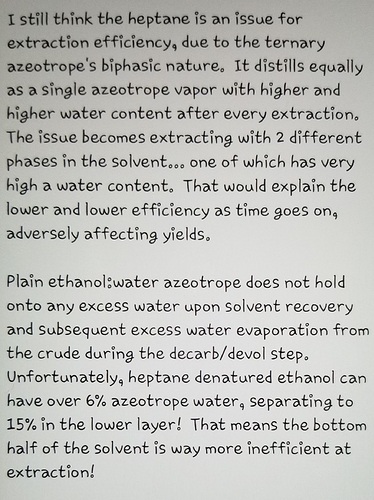 It makes a world of difference to use and reuse potable 190 proof, compared to trying to re-use heptane-denatured ethanol after it starts forming the ternary (3-component) azeotrope with water… and it WILL form that ternary azeotrope, changing over time until your extraction yields drop too dramatically to ignore! 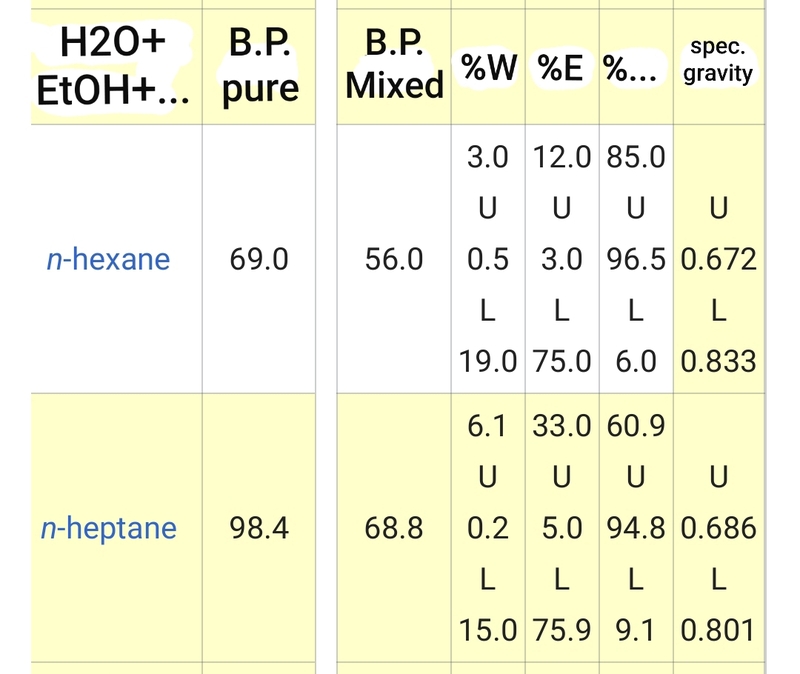 C. Excessive (read: not strongly hydrogen bonded) water in your extraction solvent will diminish your extraction efficiency (lowering yields) and selectivity for cannabinoids and terpenes (increasing undesirable content); be it the 12.3% water in the isopropanol:water azeotrope, any water in excess of 4.5% in the ethanol:water azeotrope, the 15% water in the lower layer of the ethanol:water:n-heptane azeotrope, or any other “water overloaded” mixture with solvent! Please feel free to ask questions, comment, and provide input & your personal experiences! All comers welcome! EtOH suppliers - rep / verified? Does methanol extraction avoid waxes? Thank you, this is particularly pertinent to what I’m working on right now. Would running the heptane denatured ethanol through molecular sieve beads help to limit diminishing yields due to this azeotrope? I’m wondering if this may be a futile effort in the long run drying heptane denatured ethanol. If I find I’m still pulling greens at 10min soak does that mean without a doubt my 190 proof solution isn’t reaching temperatures close enough to -67°C? I was aiming for -72°C by using 190 proof and dry ice. Oh, yeah, I wrote about that recently. Thanks for the awesome info Photon. 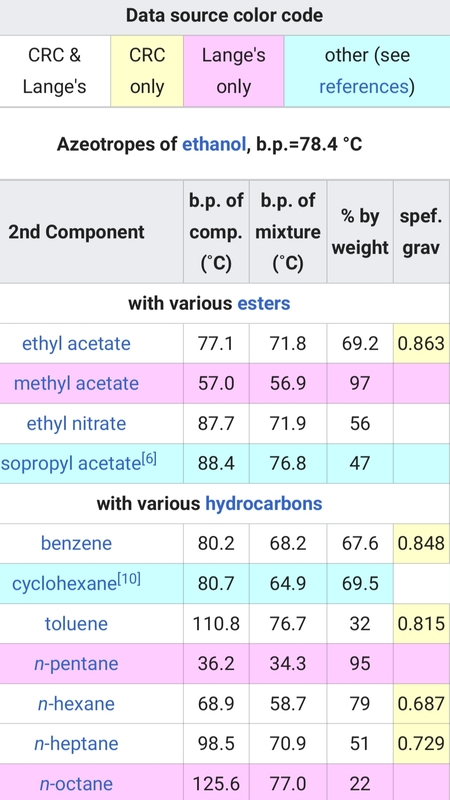 I have used heptane dn ethanol and have seen a VERY large decrease in yield lately and have been trying to determine a reason. This post could not have come at a better time. So… the inevitable question comes. For those of us using this ethanol, where can we find potable 190-proof ethanol within in a fair price range? Have you been testing to see if it’s still 190 with a proofing hydrometer? Also are you drying with molecular sieve beads in between uses? If so and your still seeing this decrease in yield that’s pretty concerning to me and I might need to change plans. Well, there are some places/licenses that may be able to reduce the taxes on the 200 or 190 proof potable ethanol if you can prove it is being used only for processing or cleaning, and that it is not being sold for drinking or use in edibles or tinctures in any way. 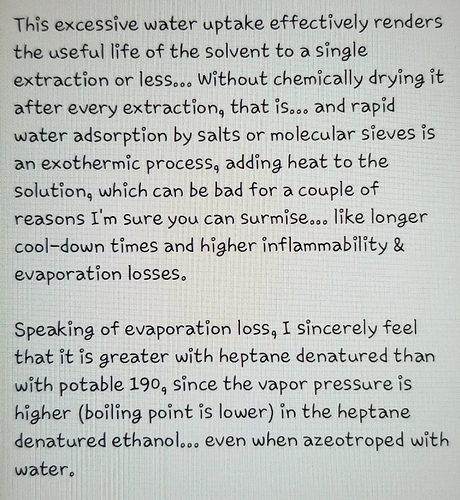 I include 200 proof, because it is a simple matter to let it absorb water from the air or simply dilute it with distilled water to 190 proof before using it. @CuriousChemist22 By putting dry ice in the ethanol, you may be A. adding excess water to the ethanol unwittingly, B. imparting effervescence and acidity (carbonic acid) that screws with the extraction, and/or C. quite possibly just not reaching a low enough temperature if you’re not measuring it accurately with a Type E or Type T thermocouple and reader. Another possibility is overgrinding or oversoaking… if you chop open the cells, there is nothing stopping the chloroplasts and chlorophyll from leaking out of them… and oversoaking is when the ethanol is allowed to warm up while still in contact with the plant matter, and adding that green ethanol to the nice gold stuff that quickly passed through in the first place. 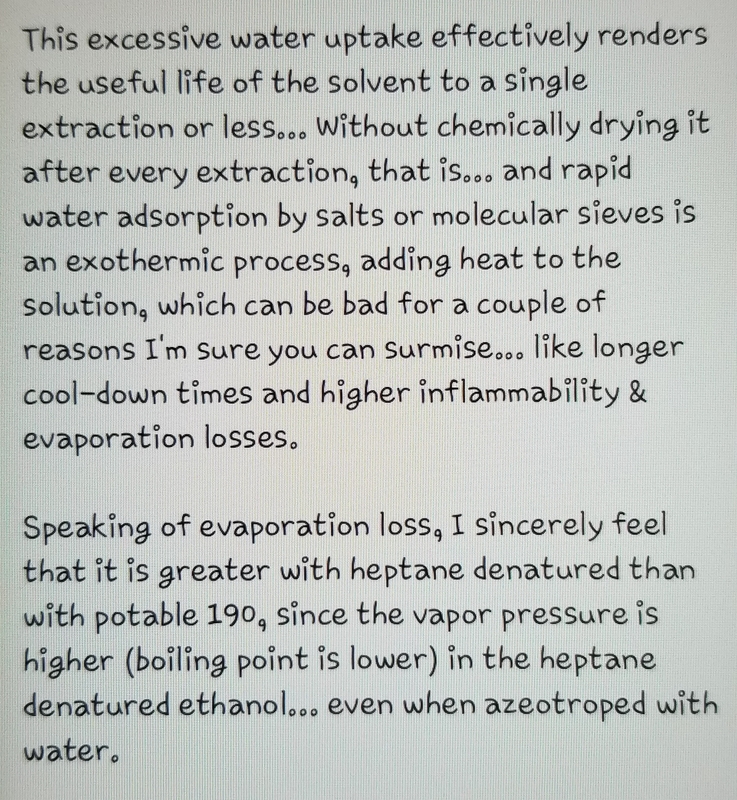 @Chimeraleaf Yes, I do check the proof of recovered potable ethanol from time to time, and it’s always fine, as long as the recovery was done properly… iow, the recovered ethanol:water azeotrope was drained before cranking up the boiler temperature to remove any excess water from, decarb, and devolatilize the crude. 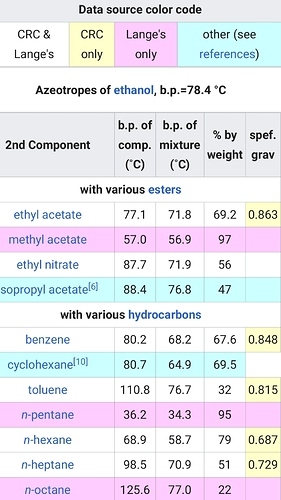 @OilArt is using heptane-denatured ethanol, so hygrometer readings are completely useless except to tell you that whatever liquid phase you have in the test cylinder has similar, lesser, or greater density at the measured temperature to/than regular ethanol:water mixtures. From @Lewis_Bronsted: look up S.D.A.-23A, @OilArt! It’s pretty easy to make your own water azeotopric ethanol and you can bang out about 2-3L/hour on a 10-15k equipment cost. It’ll cost you $2-5 per litre as well. One of my guys fucked up and popped a litre of heptane into 40-50L of alcohol. I’m not sure if it’ll work it’s way out eventually if I keep adding more fresh ethanol into the batches to dilute it out over time. I had a feeling even a little bit would start to make a difference though. Would the same problem occur with the ethanol and 5% hexane blend? Think it’s legit? Or just stick w the pure ethanol? Any luck w isopropyl? 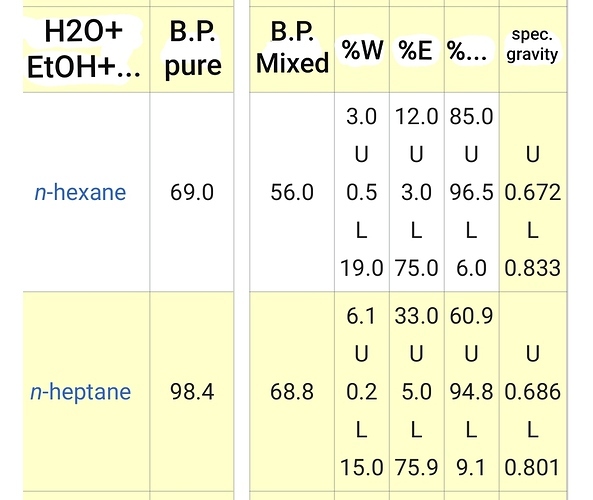 Would an 80% iso (200 proof) 20% heptane denatured ethanol mix have the same issues? Any way to remove the heptane from the ethanol when buying the denatured stuff? 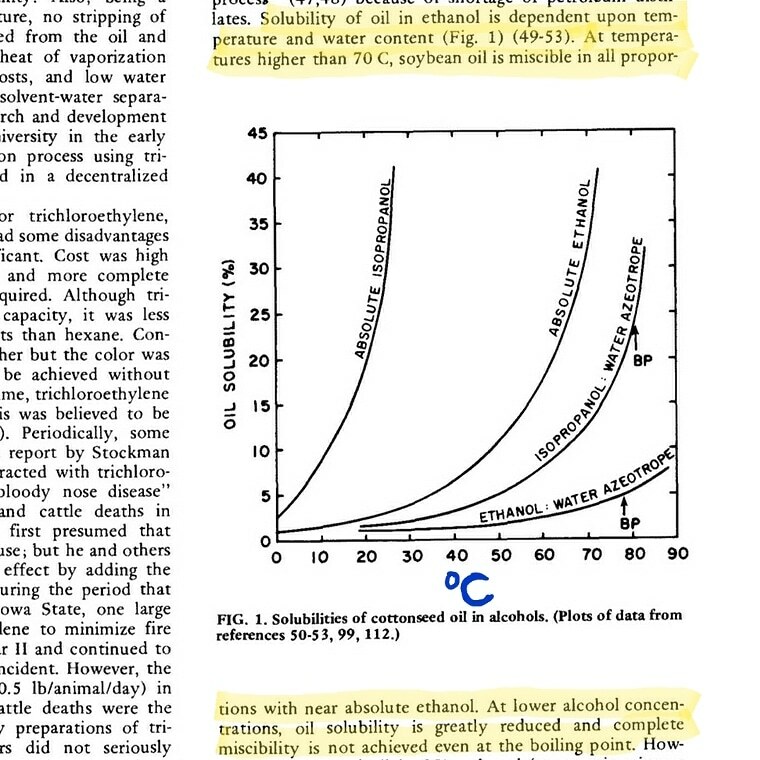 The excise tax on potable food-grade un-denatured ethanol is astronomical where I am. Because of the azeotrope we can’t use something like lle to separate the different hydrocarbons correct?